While symbolizes peace and tranquility. Many homeowners select white as their coloring scheme to have a place to come home to after a long day to relax. Yet while installing white cupboards and painting the walls white isn’t difficult to see in your mind before you install, many people struggle with white or light color floors. Will they be easy to live with? Is maintenance going to be a chore? 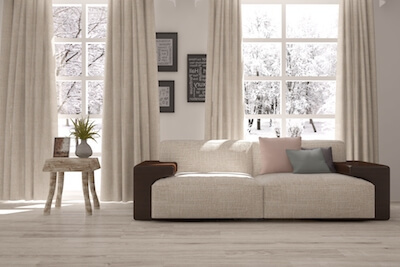 White wood flooring is one of the most popular choices when considering white/light flooring. It’s fairly easy to achieve if you already have wood in your home. Sanding the floorboards and using a white floor paint and sealant can do the trick. You can also use a light toned solid hardwood flooring – white oak or ash – and then whitewash stain the boards to your ideal color. To avoid the mess of using hardwood already in your home, you can achieve the look by installing brand new engineered hardwood floors that have been prefinished with white stain or paint. The options continue with selecting white toned luxury vinyl tiles, wood-like porcelain tiles, or stone with the white floor look and feel. Porcelain tiles aren’t just for the bathroom. With today’s technology, you can find a variety of colors, patterns, and styles, some with plank look and feel, perfect for every room in your home. In short, if you prefer a certain color with a certain flooring material, you’ll find it here. White flooring can be the perfect addition to any home. But is it right for your lifestyle? White floors do create a minimalist aesthetic. And because white is light and airy, it will go with all decor styles. From shabby-chic to modern industrial, you can blend it in any way you choose. White floors also look cleaner, brighter, more open and airy. It’s the best way to create an uncluttered, calming, peaceful space to live in. White floors also put the emphasis on your furniture and your decor rather than on your floors. This is perfect for the piece of artwork you have on display and want to make the focus point of your room. It gives you the freedom to change the look and feel easily without having to “match” the color of your floors. Of course, white floors also have their challenges. To keep white floors looking their best, you have to be willing to clean them regularly. They will show messes and furballs easier than darker shades. With a busy family, that may be a difficult task. However, you will be ensured your home is always clean – you can see when it isn’t, so it ensures you stick to a regular cleaning schedule. You should also be conscious of the white floor tone you select. Not all white tones are the same. Some extra bright tones can glare and tire your eyes, particularly if your space receives a lot of direct sunlight. And if you’re planning on painting your walls and trim white, it’s a good idea to ensure the color tones match. Have additional questions about white flooring choices?